The Patriot's box may not show the Patriot air rifle image on it. One box design is used for several Webley models. 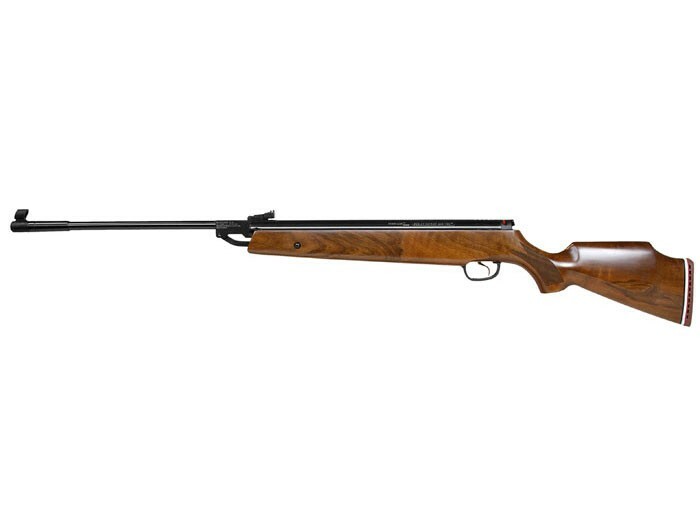 The Webley Patriot air rifle lets you take down game and pests with astonishing authority. 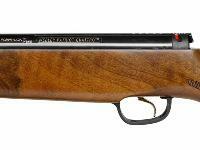 Shoot at longer ranges and take quarry that's out of reach for many other spring-piston air rifles. Of course, power means nothing without accuracy, and the Patriot really delivers! 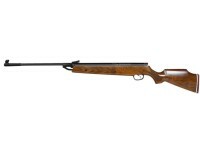 This air gun has a long-standing reputation as a superior hunting air rifle. 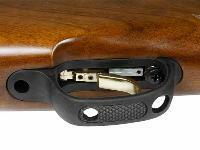 To get the most accuracy from your spring air rifle, shoot medium- or heavy-weight pellets. It'll lower the velocity a bit, but that slightly slower speed stabilizes the pellet and delivers more foot-pounds of energy to your target. If you want to extract even more accuracy from your gun, get a quality scope. 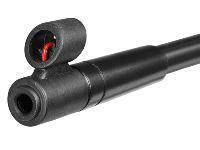 Because the Patriot's power is known to deliver a pounding shock to scopes (airgunners refer to the Patriot as a "scope breaker"), the only scopes we've recommended are those that we know can stand up to the brutal pounding of this powerhouse airgun! Things I liked: This gun excels for accuracy whether target shooting or hunting. I have the .25cal and when on a bench I can shoot 1" groups at 75yds with JSB 25.39gr dome pellets all day long. Killed many squirrels out to same distance in the 15mos I've had it. I have it scoped with UTG 4x32 and Leapers 1 piece accushot mount. Day to day consistency remains unchanged. I have 3 excellent Dianas to compare it with. I would not hesitate to buy this gun again. I have no reqrets. Things I would have changed: The trigger could be a bit more refined feeling. I am comparing to the Dianas again. Obviously I adjusted it to get the best release I can get. I have many powder burners with factory and aftermarket triggers to compare with. This trigger is ok but could use some slicking up. What others should know: .25cal is what this powerhouse deserves. Things I liked: I love the idea(at least)of a .25 cal in a springer, however I have come to the conclusion that most of the .25 cal springers are just not up to what they should be for that caliber, much over 25-30 yds. I wish to preclude anything further I say with, the Webley Patriot that "I" received, is NOT necessarily a reflection on ALL .25 cal Patriots. Mine had some wood missing that did not allow the forward wood screw for the trigger guard to tighten down, the trigger itself had a very large amount of lateral play in it and getting to group any proximity of "tight" beyond 10yds was nearly impossible, regardless of which pellets I used..though the 25.39 grain JSB's grouped the best, out at 25yds with 4 inch groups! !..and before anyone says anything, I DO know how to utilize the Artillery Hold as I also own an RWS 48, 350, Diana 52, Weihrauch HW77 & HW80 and have NO issues with any of them at all, for Any reason..and at much greater distances. Things I would have changed: Webley / Hatsan, and Hatsan in particular, needs to seriously take a second look at their "quality control",at least as far as the Patriot is concerned, they definitely have some issues in that regard. I think they need to spend a little less focus on "FPS" and concentrate a bit more on refinements & "QC". What others should know: Before purchasing a SPRINGER in .25 cal, of any manufacture, do yourself a favor and do a thorough study of ballistics, especially between .22 & the .25 particularly if your intended targets are most generally in excess of 35 yards, you just may find that a .22cal of Quality stature, such as RWS/Diana, AirArms, Weihrauch,etc..will meet your needs more suitably than a .25 cal Springer will. In my opinion, if you want a .25 cal, then a PCP is really the way to go in order to realize the true worth of that cal. because, again..in my opinion, I just don't believe (nor, have I ever seen) that the power plants of todays springers are developed to the point, yet..that they can do the .25 any real justice. I exchanged (and Upgraded) my Patriot for a Benjamin M-Rod recently (at PA) and am Very Glad that I did, the PCP Really Is worthy of the larger caliber, and a deadly joy to shoot, I love it. I also Must say, that I cannot say enough Good, about PA & staff, in a word, INTEGRITY and SERVICE. If your looking for a first class Springer in .25 and not satisfied with the Patriot I would suggest the Mod 125.25 cal Sniper,, It's hardest hitting springer in .25 cal right now on the market, using the 26 grain poly predators I'm getting 31 foot pounds of energy at the muzzle it is truly a great gun especially for a springer. Thanks for the review. 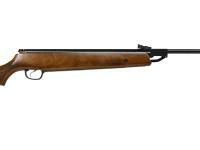 I'm new to air rifles and going to buy one. Doing allot of research. I tend to go for the 1-2 star reviews first. Ones like this are a great help do to you seemingly gave a fairly in-depth review IMO. This for the most part just verified my want of the RWS 34. Roberto: Thank you for your "Great Review" reply to mine (above),I appreciate it, and your insight on the Patriot as well. As I stated in my review, I traded my Patriot for a .25 cal. Mrod and have NOT regretted doing so at all as far as my shooting experience with the Mrod.. with the exception of the ever present need for "life support".. as with any PCP type airgun,thus I am once again considering a .25 cal. in a springer, but lets face it.. since the Webley of old (Birmingham,England) and the Beeman Kodiak Derivative-the "pickins" are pretty slim, for a .25 cal Springer with any real "muscle" behind it, and Without any real "issues" (ie: the Patriot). There are some very nice .25 Springers on the market (ie:Diana 52, Cometa 400, etc) but they lack the range to really get "out there". I keep "watching" for signs of any improvement in QC for the Patriot, but so far.. Hatsan/Webley seems to be "dragging its feet" and Not responding to the QC issues at hand, but one can always hope. 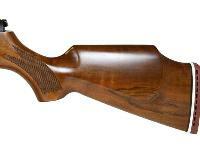 Bruce--Webley ceased making airguns in England several years ago. All their airguns are made elsewhere. The Patriots are now made in Turkey (I believe by Hatsan, but I'm not positive). 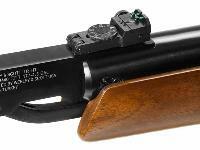 Hatsan does make quality airguns (read the reviews of their guns…generally, quite positive). The Turkish Patriots are not as hard-hitting as the ones that were made in England. I think the only way you'll find a British-made Patriot is on the used market. Those older guns were known as scope-breakers, but they definitely had a huge amount of power. Webley in the U.S. is an importer, and they have no control over where the guns are made. The Brits also have to buy Webley airguns made in Turkey, just like U.S. airgunners. I am really blown away by these comments because I have a webley patriot, 22 cal. and it is a very hard hitting, extremely accurate rifle. I have always either shot the premier 14.3 grain or the benjamin 14.3 grain through this rifle and it's deadly accurate, even at 60 and 70 yards. The one thing I wonder about is this....some of these webleys are made in engand and some of them are made in turkey. Mine is made in england and perhaps that's the difference. I wonder if the people whose comments were negative bought rifles that were made in turkey. I would love to buy another one but webley doesn't answer my emails and pyramid air is selling the rifles made in turkey which I definately don't want so I guess the webley I have is the one I'll shoot forever. Great Review! I was in same boat back in January PA has great customer service. Hatsan definitely needs to step up quality control because all they are doing is tarnishing the great history of the Webley Patriot. I STILL want one just in better shape than what I got but months later that trigger has yet to be addressed. open sight 10 to 20 yards is still brutal out of this just would have to be a bit more sneaky LOL. Again thanks for a great review!!! Things I liked: Beutiful stock. Things I would have changed: I made a mistake buying this rifle.... Already gave it to a friend that thinks can do something with it. What others should know: After beeing used to shoot with PCP's, this is like carring a very heavy bag of stones to try to obtain the accuracy of a slingshot... When I bought it I had the oportuinity of buyin a Weirauch .25... I opted for the cheapest option... I paid the bill. Are the barrels on the Patriot threaded for a suppressor ?? If not, has anyone had one threaded and a suppressor added ?? Are they made in Spain at Hatsan's or in Turkey? I have heard these are actually made in Spain by Hatsan. And have people who bought this rifle lately had or noticed any real issues? Webley closed its doors awhile back from what I have read they are made in turkey but use webley machines to build them. Hatsan owns the patriot name and hatsan puts them together now. The patriot still is stronger than hatsan 135 and has open sights so it it still a great air gun, just be sure to learn how to adjust trigger when you run into what you think is issue. The description says "spring piston". Do these rifles come in a nitro piston model ?